This article is about Donkey Kong's appearance in Super Smash Bros. 4. For the character in other contexts, see Donkey Kong. Donkey Kong (ドンキーコング, Donkey Kong) is a playable character in Super Smash Bros. 4. His return to the series was announced during the E3 Nintendo Direct on June 11th, 2013. Donkey Kong uses realistic gorilla grunts like in Super Smash Bros. Brawl, although he now has updated voice clips. Donkey Kong is currently ranked 22nd out of 55 on the tier list, placing him in the C tier, and making him the highest ranked super heavyweight in the game. This is also a moderate improvement from Donkey Kong's placement in Brawl, where he was ranked 21st out of 38, and is his best placement in the series to date. Donkey Kong retains his outstanding power, deceptively fast mobility, and great spacing options, but has also been improved both directly and indirectly. Donkey Kong now boasts great combo potential thanks to his "cargo up throw", which has been re-purposed into a very reliable combo starter that boasts guaranteed and extremely damaging follow-ups at varying percentages, alongside KO confirms into his up aerial at a wide range of percents. Changes to game mechanics have also improved DK: the removal of both chain grabbing and edge-hogging drastically improve his endurance and recovery, respectively, whereas rage supplements his power, granting him an effective advantage state. However, Donkey Kong retains many of his flaws from Brawl. His large hurtbox has become even larger, making him even more susceptible to combos than before. In addition, he remains very susceptible to edge-guarding because of his recovery's poor vertical distance and safety, alongside his ineffective ledge options. Finally, many of Donkey Kong's moves are surprisingly unsafe on hit at very low percentages, and he has major issues dealing with crossups or spaced aerials on shield due to his slow out of shield options. Nevertheless, Donkey Kong's strengths generally outweigh his weaknesses, to the point that he has achieved above average results in competitive play, largely thanks to HIKARU, Tweek, Konga and DKwill. As the second heaviest character in the game, Donkey Kong is unsurprisingly a super heavyweight. However, he is also one of the fastest heavyweights in the game in terms of both movement and attack speed, to the point that he defies the typical heavyweight archetype. He has the 9th fastest walking speed and the 22nd fastest dashing speed, above average falling speed and gravity, and very fast air speed, but below average air acceleration. His large size also gives his attacks great physical range. As expected, Donkey Kong's greatest asset is his power. In typical heavyweight fashion, Donkey Kong has a plethora of reliable KOing options (sweetspotted up tilt, all of his smash attacks, his forward, back, up and down aerials, his back throw, Giant Punch, and grounded Spinning Kong) and high endurance thanks to his high weight and fast falling speed. However, his aforementioned mobility and frame data (almost all of his attacks are faster than any other super heavyweight) gives him an effective approach and makes it easier to land his attacks, further complemented by his large reach. Conversely, his moves that lack KO potential are effective for set-ups, thanks to their high speed, low knockback, and favorable launch angles. Thanks to these attributes, Donkey Kong can rack up damage and KO his opponents not only quickly, but safely, compared to most heavyweights. Donkey Kong also has the second best vertical and horizontal endurance in the game, being surpassed by only King Dedede vertically and Bowser horizontally. Donkey Kong's grounded moveset is very useful; his neutral attack can be jab canceled for follow-ups, and can jab lock, as well as being able to set up into grab, his forward tilt is great for spacing, as it has long range and is intangible, his up tilt is a decent combo starter at low percentages, and his down tilt has incredible speed and can trip opponents, making it ideal for starting or extending combos. All of his smash attacks pack incredible power and have very long ranges, while not being particularly slow either. To complement his ground game, Donkey Kong's aerial game is extremely effective. His forward and down aerials can meteor smash and can effectively finish off his combos or his opponents, thanks to their high power. His neutral aerial is very quick and can lead into follow-ups, or it can be used to give Donkey Kong some space. His up aerial launches opponents upwards, making it great for combos and KOing. His back aerial is long-ranged, has a long-lasting hitbox, and can be used to edge-guard opponents. The last three aerials can also auto-cancel in a short hop, further demonstrating their utility. Finally, Donkey Kong's fast air speed allows him to easily pursue opponents in the air. In addition, the aforementioned combo abilities pair well with his grab game. Donkey Kong's grab range is the second largest non-tether grab in the game (being surpassed only by Greninja's), while his grabs are decently fast, making them very easy to land. His pummel is fairly fast, making it great for racking up damage. While his up and down throws are rarely used because of their limited utility, his forward and back throws make up for that. His back throw is the tenth strongest in the game, making it a viable KO option. Donkey Kong's forward throw is an all-purpose throw, as well as an excellent damage racker. Using it will open up four different throws, commonly known as the "cargo throws". Cargo down throw is a semi-spike and is great for edge-guarding. Cargo back throw deals 12% and can KO at very high percentages near the upper blast line. His most notable throw, however, is his cargo up throw, which can lead into any aerial at lower percents. Since it connects directly into his powerful up aerial at most percentages, this combo can be used to KO opponents at specific percentages, and has since been nicknamed the "Ding Dong". Donkey Kong's special moveset has a lot of utility. Giant Punch is a deadly KO move, and a fully charged one has super armor, making it difficult to interrupt. Headbutt can bury opponents, leaving them exposed to any move. It also does strong shield damage, threatening attempts to block the move. Hand Slap has very long range and allows for stage control, but since it is a quake move, it has no effect on aerial opponents when it is performed on the ground. However, an aerial Hand Slap is now capable of meteor smashing and is not only fairly easy to land, but it is an effective one as well. Finally, Spinning Kong can be used as an out of shield option, thanks to its super armor and high damage output. As a recovery, it lets Donkey Kong move horizontally quickly and for a long time, giving him a very long horizontal recovery. Spinning Kong also retains its ability from Brawl to completely negate all momentum, against both horizontal and vertical knockback however, this is considered impractical and nearly impossible to utilize due to the changes to hitstun canceling. Despite these advantages, Donkey Kong has noticeable flaws. His most notable flaw is his poor defensive game. Although his large size gives him high reach, it also makes him very easy to hit. While his out of shield game is strong, Donkey Kong's shield itself is rather poor, due to it being unusually small for a character of his size (like Ganondorf), making him heavily vulnerable to shield stabbing. His rolls and edge recovery options are also very slow. With all of this working against him, Donkey Kong is heavily vulnerable to combos and juggling, worsened by his lack of combo breakers (due to his polarizing aerials) and lack of good dodging options outside of aerial maneuvering. Despite being very fast in terms of start-up, Donkey Kong's moveset is slow in regard to ending lag, making him susceptible to punishment without careful spacing. Finally, his vertical recovery is almost nonexistent, due to Spinning Kong's vertical distance being considerably low. This also makes it extremely difficult for him to survive even the weakest meteor smashes. Custom moves can give Donkey Kong considerable benefits, more so than most other characters. Kong Cyclone is often considered to be Donkey Kong's most valuable move, as well as the best custom in the game: it grants super armor, has a suction effect, can be auto-canceled, and possesses greater power, maneuverability and speed compared to Spinning Kong. Altogether, these traits enable Kong Cyclone to significantly improve DK's neutral game. Chopper Kong does no damage and grants less horizontal distance, but covers more vertical distance, enabling Donkey Kong to survive meteor smashes more effectively. Storm Punch has a push effect, and is very effective for edge-guarding and spacing. Lightning Punch charges much faster, giving Donkey Kong a more readily available KO option in case his moveset can't get the job done. However, it deals less damage, more so than Storm Punch. Jumping Headbutt has more vertical range and a hitbox during most of its descent, making it a good alternative to fast falling, but at the cost of being unable to properly bury opponents. Stubborn Headbutt eschews its role as a pressure move due to its slow start-up. However, it has higher power and super armor, protecting Donkey Kong from any attack. Focused Slap and Hot Slap sacrifice range for paralysis and vertical range, respectively. Both are also potent KOing options, with the latter having high diagonal knockback, and the former having extremely high vertical knockback. Overall, Donkey Kong is a potent character; with speed, power, range, endurance, and easy-to-use combos, there are very few matchups he cannot overcome. As a result, DK is, alongside Bowser, one of the two most effective super heavyweights in the game. This, in turn, is reflected in his presence in the competitive scene, as he has average tournament representation and above average results, the latter of which has been thanks to the likes of HIKARU, Tweek, Konga and DKwill. Donkey Kong has been buffed considerably in the transition from Brawl to SSB4. The most noticeable improvement has been to his overall speed; his attacks, such as his signature Giant Punch, are now performed faster, and his already excellent movement speed has also been greatly increased, allowing him to better keep up with, and in quite a few cases, even out-speed certain lightweights. He is also much heavier, which allows him to withstand potential KOs easier, and enables him to become an effective user of the rage mechanic, which supplements his already outstanding power becoming even more effective. In addition, Donkey Kong's endurance has drastically improved, thanks to the removal of chain grabbing. Finally, DK benefits considerably from the removal of edge hogging and the introduction of edge stealing, which prevents his poor vertical recovery from being edge-hogged. Although he was buffed, Donkey Kong did receive a few noticeable nerfs. His grab game was slightly worsened and many of his attacks now deal less damage. Even with the removal of chain grabbing, his increased falling speed and larger hurtbox make him easily susceptible to combos regardless, although he is still less susceptible to being juggled. However, these nerfs are considered to be largely negligible due to the impact of his initial buffs and especially because of the subsequent buffs he has received in game updates. As a result, he is considered to be more viable than he was in Brawl. Due to the aesthetic used in SSB4, Donkey Kong's skin is sleeker, his tie is more vibrant, and his fur is of a significantly higher visual quality than in Brawl. His teeth are also white, instead of straw yellow. Altogether, these changes make Donkey Kong appear virtually identical to his appearance as of Donkey Kong Country Returns. Donkey Kong is significantly more expressive. He now scowls during certain attacks, his up taunt, and while hanging from an edge; he appears confused during his down taunt and while teetering; his irises shrink when he is hit, grabbed, screen KO'd, and when an opponent escapes his grab; his eyes comically bulge outward when he is launched; he sports a toothy grin during his side taunt, backflipping and chest-beating victory poses, and standing and pivot grabs; and he smiles with his lips pursed during his self-congratulatory victory pose. The majority of Donkey Kong's animations are also more fluid. Idle pose's animation has slightly changed. Donkey Kong now purses his lips, instead of slightly baring his teeth. Aside from his down taunt's voice clip, Donkey Kong's other voice clips have been updated. Like other large characters, such as Bowser and King Dedede, Donkey Kong's general size in proportion to the other playable characters is also greater than in previous installments. This improves his range, but makes his hurtbox larger. Donkey has two new alternate costumes. Donkey Kong is heavier (116 → 122). This improves his endurance, but makes him more susceptible to combos. Donkey Kong walks faster (1.2 → 1.3). Donkey Kong dashes faster (1.622 → 1.7031). Donkey Kong's air speed is faster (1.081 → 1.15). Donkey Kong falls faster (1.58 → 1.63). This slightly improves his vertical endurance, but makes him slightly more susceptible to combos. Shield is larger, as it now fully covers Donkey Kong while it is at full health. Donkey Kong's ground release animation has received 10 more frames, now matching the rest of the cast. This gives him less time to counterattack. The changes to hitstun canceling both help and hinder Donkey Kong. They significantly improve his combo potential, but make him more susceptible to combos. The removal of chain grabbing significantly improves Donkey Kong's endurance. The removal of meteor canceling both helps and hinders Donkey Kong. It significantly improves the reliability of his meteor smashes, but makes him significantly more susceptible to meteor smashes. Neutral attack's first hit's body hitbox has altered knockback (0 (base)/100 (growth) → 35/25) and its angle has been altered (140° → 110°/130°). This makes it connect together better with its second hit. Neutral attack's first and second hit have shorter durations (frame 5-7 → 5-6 (first hit), frame 6-11 → 6-7 (second hit)). Neutral attack's animation has slightly changed. Donkey Kong now turns farther inward when throwing the hook. Upward angled forward tilt deals 1% less damage (12% → 11%). Down tilt deals less damage (8% → 7% (arm)/6% (hand)) and has decreased base knockback (20 → 10). This improves its combo potential, but hinders its spacing potential. Donkey Kong has a new dash attack, the Barrel Roll. Compared to the previous dash attack, it has less start-up (frame 10 → frame 9), ending lag (frame 55 → 42), and a longer duration (frames 10-21 → 9-24), making it safer. Dash attack deals 1% less damage (11% (clean)/9% (late) → 10%/8%) compared to the previous dash attack. This makes it more effective for combos, but less effective at spacing. All smash attacks now have transcendent priority, improving their reliability. Forward smash deals 1% less damage (21% → 20% (hands), 18% → 19% (body)) and has decreased knockback growth (94 → 91), hindering its KO potential. It also has smaller hitboxes (6.4u/6.8u/4.3u/3u → 5.7u/3.7). Sweetspotted forward smash's angle has been altered (361° → 46°). Forward smash now grants intangibility to Donkey Kong's head and arms on frames 20-26. The 19% damage increase to shields and the increase to shieldstun significantly improve sweetspotted forward and down smash's shield pressuring potentials. Up smash has decreased knockback (40 (base)/93 (growth) → 30/83), hindering its KO potential. Its hitbox is also smaller (9.5u → 8.8u/7u). Down smash has received hitboxes at the tips of Donkey Kong's fists that deal 18%, improving its safety and slightly increasing its overall duration. Down smash has decreased knockback growth (100 → 88), hindering its KO potential. Additionally, its new hitboxes also do not compensate for its decreased knockback growth because of their lower base knockback (35 → 30). Lastly, its arms and fists' hitboxes are smaller (7u → 4u/6u). Down smash's angles have been altered (115°/98° → 70°, 55°/82°). Neutral, back, and up aerial have increased landing lag (15 frames → 17 (neutral), 15 frames → 18 (back), 22 frames → 25 (up)). Forward aerial no longer deals consistent damage (16% → 16% (early)/15% (clean)/13% (late)), although its knockback growth was somewhat compensated (100 → 85 (early), 85 → 100 (clean/late)). Forward aerial's late hitbox has less base knockback compared to its previous hitbox (50 → 30). Forward aerial has decreased start-up lag (frame 25 → 18). Forward and down aerial have decreased landing lag (30 frames → 29 (forward), 31 frames → 24 (down)). Back aerial has decreased knockback growth (100 → 97), hindering its KO and spacing potential. Up aerial deals 1% less damage (14% → 13%), hindering its KO potential. Down aerial has decreased start-up lag (frame 18 → 14). Down aerial has a shorter duration (frames 18-23 → 14-16). Sweetspotted down aerial also has decreased base knockback (38 → 30). Due to its angle being altered (270° → 361°), sourspotted down aerial is no longer a meteor smash. All grabs have increased ranges. Standing and dash grabs can also now grab certain characters hanging on an edge. Dash grab has decreased ending lag (frame 50 → 39). Standing and pivot grabs have increased ending lag (frame 30 → 31 (standing), frame 36 → 37 (pivot)). Pivot grab also has increased start-up lag (frame 10 → 11). Grabs' animations have slightly changed. Donkey Kong now grabs with one hand, instead of both. Cargo forward throw deals 2% more damage (8% → 10%). Cargo back throw deals 4% more damage (8% → 12%), although its knockback was somewhat compensated (80 (base)/50 (growth) → 70/80). Cargo back throw's angle has been altered (55° → 72°). This improves its KO potential near the upper blast line, but significantly hinders its stage spike potential. Cargo up throw deals 3% more damage (7% → 10%), although its knockback was somewhat compensated (90 (base)/30 (growth) → 58/52). These changes grant it combo potential at low to high percentages. Cargo down throw deals 1% more damage (6% → 7%), although its knockback was somewhat compensated (65 (base)/26 (growth) → 50/38). Its angle has also been altered (28° → 48°). Altogether, these changes improve its stage spike potential. Down throw's animation has slightly changed. Donkey Kong has a new edge attack, a forearm club. Compared to the previous edge attacks, it is slower and has less range than the one used below 100%, but is slightly faster than the one used at 100%+. Giant Punch takes longer to fully charge (127 frames → 144) and has increased ending lag (frame 45 → 48 (uncharged), frame 59 → 63 (fully charged)). The 19% damage increase to shields and the increase to shieldstun significantly improve fully charged Giant Punch's shield pressuring potential. However, its shield damage was compensated (2 → 0). Giant Punch now has transcendent priority, improving its reliability. Uncharged Giant Punch has decreased start-up lag (frame 25 → 18 (clean grounded/clean aerial)/19 (late grounded/late aerial)). Fully charged Giant Punch's has increased super armor frames (frames 17-20 → 11-20). Giant Punch's wind-up is lower pitched. Aerial clean Headbutt deals 4% less damage (14% → 10%) and its meteor smash hitbox is more difficult to land. It also barely stalls Donkey Kong's descent, significantly hindering its recovery potential. Grounded Headbutt has increased range. Headbutt has increased ending lag (frame 60 → 64). The 19% damage increase to shields and the increase to shieldstun significantly improve Headbutt's shield pressuring potential. However, its shield damage was compensated (30 → 25). Grounded Spinning Kong's first hit deals more damage (5% (arms)/4% (body) → 7%). Additionally, due to their angles being altered (361° → 20°/180°), its loop hits connect together better. Lastly, it has increased super armor frames (frames 10-16 → 8-17). Grounded Spinning Kong's loop hits deal 1.7% less damage (3% → 1.3%). Grounded Spinning Kong's animation has changed. 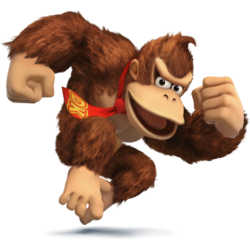 Donkey Kong now performs a series of discus clotheslines and spinning backfists before striking a flexing pose upon finishing. This new animation lengthens its duration (frames 19-56 → 19-62) and improves its vertical range, but increases its ending lag (frame 85 → 94). The weakening of SDI makes Spinning Kong significantly more difficult to escape from. Hand Slap has larger hitboxes. Hand Slap can now be used in midair, with its second hit being a meteor smash. These changes significantly improve its edge-guarding potential. Hand Slap has increased ending lag (frame 61 → 75). The 19% damage increase to shields and the increase to shieldstun significantly improve Hand Slap's shield pressuring potential. Konga Beat's visual effects have changed. It is now accompanied by a bar that indicates when to press the special button in rhythm with the beat, similarly to the display in Donkey Konga. This significantly improves its reliability. Konga Beat's animation has slightly changed. If Donkey Kong performs all of its button presses with the correct timing, he will strike a thumbs up pose at its conclusion. Donkey Kong has been significantly buffed overall via game updates. Update 1.0.6 saw Giant Punch's charging time decreased, whereas update 1.0.8 buffed the damage outputs of all variations of his cargo throw, which helped his initially weakened grab game. Update 1.1.0 gave DK his most useful buff, however, by altering cargo up throw's knockback to the point of effectively being re-purposing into a very useful combo starter into his aerials, most notably up aerial. Thanks to this new combo, which has been nicknamed the "Ding Dong", Donkey Kong now boasts as a potential KO confirm, much like how Diddy Kong did with his "Hoo Hah" combo. Outside of this, update 1.1.0 also made his dash attack faster and increased its duration. Although update 1.1.1 reduced the shield damage dealt by Giant Punch and Headbutt, this was compensated by the increased shieldstun brought about by the same update, which significantly benefits Donkey Kong's powerful, high hitlag attacks by making them safer on shield. While the changes to shield mechanics also inhibit his effective out of shield options and his already unimpressive shield, these nerfs are largely negligible. Overall, Donkey Kong's buffs outweigh his nerfs, to the point that he is considered to be significantly better than he was during SSB4's initial release. Neutral attack's first hit's angle altered: 361°/140° → 361°/110°/361°/130°. Giant Punch's charge time decreased: 172 frames → 144. Headbutt no longer stalls Donkey Kong in midair, removing its recovery potential. Dash attack's start-up: frame 10 → 9 and ending lag decreased: frame 49 → 42, and its duration increased: frames 10-21 → 9-24. Forward smash's hitbox size increased: 5u → 5.7u and its bone intangibility on Donkey Kong's head and arms have received additional frames: 20-26. Up smash's hitbox sizes increased: 7.5u/6u → 8.8u/7u. All variations of Giant Punch deal less shield damage: 2 → 0. All variations of Headbutt deal less shield damage: 30 → 25. 4% A hook followed by an uppercut. At very low percentages, it can combo into itself or work as a fairly reliable set-up for a fully charged Giant Punch. However, its first hit can also be jab canceled into forward tilt, down tilt or a grab, which is further supplemented by the first hit's tip launching the opponent towards Donkey Kong instead of away from him. 11% A backhanded slap. Can be angled, with the upward angle dealing the most amount of damage and the downward angle dealing the least. 11% (arm), 10% (elbow), 9% (hand) An overhead arcing swipe. It has a very reliable range and deals more damage and knockback if the target is hit near DK's shoulder. Slouch Slap 7% (arm), 6% (hand) A crouching swat. Slightly less powerful around his fingers. In addition to its great speed and range, it has a chance to trip opponents, allowing for guaranteed follow-ups such as itself, a pivoted up tilt, forward smash, Giant Punch, Headbutt, Hand Slap or a grab. 10% (clean), 8% (late) The Roll Attack, his signature attack from Donkey Kong Country. It deals less damage towards its end. 20% (hands), 19% (arms) A lunging clap. It deals slightly less damage if it hits with Donkey Kong's arms. KOs at 92% uncharged and at 54% fully charged without rage. 18% An overhead clap. Unlike other up smashes, it does not launch opponents into the main hitbox, making it somewhat problematic to land if the opponent is not airborne or incredibly close to him. However, it can be effective if used beneath a platform. KOs at 102% and 63% uncharged. At full rage, it is slightly more powerful than his Brawl up smash. Donkey Kong's head and arms are intangible while the hitboxes are out. 14% (arms), 17% (early, fists), 18% (late, fists) Raises his arms overhead and then quickly swings them downward to perform forearm clubs. It has decent range, fast start-up for a smash attack, and deals great vertical knockback. It KOs starting at 101% when sweetspotted, it is especially good for punishing rolls and laggy attacks, and is a reliable out of shield option. It could arguably be considered one of the best down smashes in the game, despite its fair amount of ending lag. 11% (clean), 8% (late) Quickly spins around to perform discus clotheslines with both arms, similarly to Spinning Kong. It is not the fastest of DK's aerials, but has the longest lasting hitbox and the lowest amount of ending lag. Additionally, its late hit has excellent combo potential when SHFF'd, but it requires good timing due to its hitbox not being optimally positioned compared to his other aerials. 16% (early), 15% (meteor smash), 13% (late) A double axe handle. If sweetspotted, the opponent is meteor smashed. Like many other moves, its early hitbox is weaker than its meteor smash hitbox, to the point that it is even weaker than the late sourspot despite dealing more damage. However, the early hitbox launches opponents away by dealing extreme horizontal knockback, making it more effective for KOing horizontally. It appears similar to his midair attack from Donkey Kong 64, which itself was inspired by this attack due to SSB debuting before Donkey Kong 64. 13% (clean), 8% (late) A back kick. A useful move courtesy of its decent power, large, lingering hitbox and minimal start-up, ending and landing lag. Its low ending lag allows it to initiate a wall of pain. 13% An upward headbutt. DK's head is intangible as soon as the attack begins. Its high damage output and knockback make it a viable KOing option and the most potent follow-up from "cargo up throw". It also autocancels in a SHFF, making for an excellent juggling option and frame traps landing air dodges with ease. 16% (sweetspot), 13% (sourspot) A stomp. Its sweetspot is a strong meteor smash, while its sourspot, which is close to Donkey Kong's chest, deals diagonal knockback. However, it is a rather laggy attack despite its fairly quick start-up. — Reaches out. Donkey Kong's overall grab range is the second longest in the game, being surpassed only by Greninja's. 2.1% A slap. A fairly fast pummel. Kong Karry 10% (forward), 12% (backward), 10% (upward), 7% (downward) Cradles the opponent on his back, allowing him to move and jump around while still holding the opponent. This gives him access to forward, back, up, and down throws that are distinct from his normal grabs. Forward: Launches foes away from DK at a high angle. High base knockback allows DK to KO opponents in rare situations, such as a grab on the Smashville / T & C platforms. Also makes for a powerful, yet risky stage spike. Back: Heaves the opponent backward using both hands, launching them at a slightly higher trajectory. Can be performed easily by tilting the C stick (attack / smash) backwards. Can be used to KO opponents at ~150%. Up: Heaves the opponent upward. Its very low base knockback allows for follow-ups, especially when preceded by a jump, such as his up aerial (which can be performed twice in a row), his back aerial (also capable of comboing into itself), his forward aerial for significant damage, or Charged Giant Punch (VS fastfallers). At medium to high percentages, its up aerial combo can set up an early KO with his up aerial when preceded by a jump, making it reminiscent of Diddy Kong's "Hoo-Hah" combo. This combo is referred to by players as the "Ding Dong" combo. Down: A gorilla press slam. It launches the opponent horizontally, which allows it to be used off-stage as a surprise KO option against opponents with poor recoveries, such as Little Mac. DK performs a little hop during the animation, allowing him to maintain his height through the animation of the throw while airborne. 7% Shoves the opponent into the ground with one arm. It has rather weak knockback and launches opponents horizontally in front of DK. 8% Performs a forearm club while climbing up. Default Giant Punch 10% (uncharged/one wind-up), +2% (per wind-up), 28% (tenth wind-up/fully charged grounded), 25% (tenth wind-up/fully charged aerial) A wind-up punch which fully charges after ten wind-ups, with an eleventh wind-up letting DK store the maxed charge. A fully-charged punch deals excellent damage, grants super armor, and is overall faster than if used uncharged. Its charge can charge canceled and saved sooner, and chosen when to be released. DK will be rendered helpless if he uses it in midair. Custom 1 Lightning Punch 12% (uncharged), 16% (five wind-ups), 15% (fully charged, six wind-ups), 8% (uncharged aerial) (all punches become 2% weaker from farther away) An electrical version that takes less time to fully charge (six wind-ups at significantly increased speed), but deals much less damage and lacks super armor at full wind-ups. Custom 2 Storm Punch 8% (uncharged), +2% (per wind-up), 18% (fully charged) Deals less damage, but produces a powerful windbox that will push back opponents and takes less time to charge. Higher ending lag and lacks super armor but takes less time to fully charge than Giant Punch. Default Headbutt 10% (grounded/sweetspot aerial), 8% (sourspot aerial) A headbutt. The move buries the opponent, who will remain submerged longer the more damage they’ve taken. The aerial version will meteor smash the opponent if they are hit by its sweetspot. Unlike in Brawl, it will not stall DK in the air. It has a deceptively large range and high shield damage, so full power shields will barely manage to avoid breaking against this move. Custom 1 Jumping Headbutt 5% (aerial), 10% (grounded) A jumping headbutt, which is slightly faster and possesses increased vertical range. However, buried opponents can break out faster and Donkey Kong will self-destruct if he uses it off-stage outside edge grabbing distance. Custom 2 Stubborn Headbutt 13% Has a significantly longer start-up, but has super armor for its entire duration. Also deals more physical and shield damage. Default Spinning Kong 7% (grounded hit 1), 1% (grounded hits 2-6), 4% (grounded hit 7), 18% (all grounded hits connect), 10% (aerial hit 1), 2% (aerial subsequent hits), 36% (all aerial hits connect) Rapidly spins around, trapping opponents and damaging them with a series of discus clotheslines and spinning backfists before launching them. If used in the air, it grants invincibility from frames 3-6, and its initial hitbox deals moderate knockback, making it a good edgeguarding tool. It also serves as an excellent horizontal recovery, but it grants poor vertical recovery. If used on the ground, it grants super armor at the very start and Donkey Kong spins slower at an angle with more vertical range, making it a decent out of shield option. Custom 1 Chopper Kong — Grants increased vertical distance, but almost no horizontal distance and deals no damage. Custom 2 Kong Cyclone 4% (grounded hit 1), 3% (aerial hit 1), 15% (grounded hit 2), 12% (aerial hit 2) Pulls in opponents in with a windbox while spinning, then launches them with its last hit. The grounded version has no hitboxes except for its first and last hits. The aerial version deals no damage except for its first and last hits, but does deal hitstun. Both the grounded and aerial versions have super armor during the spin, but the aerial version does not rise as high as Spinning Kong. Default Hand Slap 14% Slaps the ground to cause earth-shaking vibrations. When grounded, Donkey Kong can keep pounding by repeatedly pressing the special button. The attack gives him some protection from opponents while grounded and has good range, but is unable to KO until extreme percentages due to its very low knockback growth. In midair, Donkey Kong will perform two midair slaps, the second hit being a powerful meteor smash that combos from the first slap. Originates from Donkey Kong Country. Custom 1 Focused Slap 7% (hit 1), 14% (hit 2) Paralyzes opponents and launches with high vertical knockback from the second hit, reliably KOing around 100% without rage, but decreased range and is unable to meteor smash. Custom 2 Hot Slap 4% (hit 1), 12% (hit 2), 5% (aerial hit 1), 5% (aerial hit 2) Flaming pillars erupt in front of DK instead of earth-shaking vibrations in both directions. It only generates hitboxes in front which doesn't reach out far, but has decent vertical range, much less start-up and much more knockback growth than Hand Slap, giving it better KO potential. However, it does not meteor smash if used in the air. Konga Beat 7% (initial shockwave), 1-2% (no/bad input), 7-12% (good/great input), 12-24% (great input, close) Takes out the DK Bongos and begins to play them to the beat of "DK Island Swing", which emits shockwaves in the process. The song is accompanied by an indicative bar that will appear above DK, signaling the player when to press the attack button in sync with the beat. The attack’s range and power is determined by the player's input, with successful inputs having the greatest range and power. If the player hits all beats correctly, DK will give a thumbs up at the end of the song. Bursts out from a DK Barrel and strikes a flexing pose. Up taunt: Beats his chest while scowling. Side taunt: Shakes himself as if he was wet, during which he will sport a toothy grin before making a humorously confused expression. Down taunt: Faces the camera and shrugs his shoulders while grunting and making a humorously confused expression. Leans forward curiously while pursing his lips. Punches his open palm with his fist or claps his hands once, then performs an external shoulder rotation stretch. D-K! Donkey Kong! Don-key Kong! A flourished remix based on the jingle that would play whenever Donkey Kong completely cleared a bonus room or defeated a boss in Donkey Kong Country. Beats his chest and then faces the screen while sporting a toothy grin. Does a backflip and then strikes a flexing pose. It appears very similar to his "character chosen" animation in SSB. Clenches his hands together and shakes them overhead in a self-congratulatory manner. This is a reference to an animation he performs after winning in a Bonus Area or defeating a boss. Average Joe - 9th at Glitch, 25th at The Big House 5, formerly ranked 17th on the MD/VA/DE Smash 4 Power Rankings, regularly attends Xanadu tournaments. DKwill - One of the best Donkey Kong players in United States along with Tweek and Konga, 1st at Don't Park on the Grass, 4th at SKTAR 4, 9th at Get On My Level 2016, 25th at GENESIS 3 and The Big House 6, 33rd at Apex 2015, EVO 2015 and CEO 2016, ranked 9th on the New York City Power Rankings. False - One of False's many characters. Notably defeated MkLeo at EVO 2017, where he finished 9th. HIKARU - The best Donkey Kong player in Japan and one of the best Donkey Kong player in the world. He often places Top 8 at Sumabato tournaments, 7th at 2GGC: Civil War, 9th at Sumabato for THE BIG HOUSE, 33rd at EVO 2016. Konga - Regarded as the best solo Donkey Kong player in the United States and one of the best Donkey Kong players in the world. Ranked 30th on the Panda Global Rankings v4. Placed 2nd at Don't Park on the Grass and 7th at DreamHack Austin 2017. Has set wins over VoiD, MkLeo, Tweek, and ANTi. Larry Lurr - The best Fox player in the world with a very strong Donkey Kong secondary. Considered the best Donkey Kong player in SoCal and one of the best ones in the world. Ranked 7th on Panda Global Rankings v4 and 2nd on SoCal Smash 4 Power Rankings. Has wins over players such as Mr.R, VoiD, Elegant, ESAM, Ally, Zenyou, and Tsu-. Tweek - Uses him as a secondary, with set wins over ZeRo, MkLeo, komorikiri, Mr.E, and Tyrant. Regarded as the best Donkey Kong player in the world. Vex Kasrani - 13th at KTAR XIII, 7th at KTAR XVII. Glare - The best DK in New England, and one of the best DK players in the US. Has since switched mains to Bayonetta. Mew2King - 3rd at PAX Prime 2015 and 5th at SKTAR 4. Defeated Saj, Mr.E, MVD, dyr, Day and Ryo using the character. Upon SSB4's release, Donkey Kong was considered a bottom-tier character, despite the good buffs he had received in his transition from Brawl, mostly as a result of his pronounced weaknesses and his strengths not fully compensating for it. Opinions of Donkey Kong would slowly start to improve, as players later noticed he had indeed gained more than what he lost in the transition to SSB4, leading him to be seen as a low-tier character instead of a bottom-tier character in most eyes. While he would gain dedicated mains like DKwill and buffs via game updates, it was not until update 1.1.0 that Donkey Kong's reputation would improve considerably. This was due to said update granting him a massive buff for his grab game in the form of his now-famous "cargo up throw", which allows for what is known as the "Ding Dong" combo, which is reminiscent of Diddy Kong's "Hoo Hah" combo, albeit not to the same extreme degree. Because of the huge benefits as well as the true combos that can be performed with this throw, Donkey Kong's popularity started to increase at all levels of play, with professionals such as DKwill, Average Joe, HIKARU and Mew2King making a larger impact in tournaments. As a result, Donkey Kong was ranked 27th on the first 4BR tier list, then rose to 25th on the second tier list, and then dropped to 28th on the third tier list, losing his title of the best super-heavyweight character to Bowser. Even so, the improved results of players like HIKARU, Konga and Tweek have allowed Donkey Kong to rise to 22nd on the fourth and current tier list; since the tiers were expanded, Donkey Kong has now become a high-tier character, in addition to recovering his status as the best super heavyweight once again from Bowser. As such, despite him remaining slightly rare in competitive play, his results by the players who use him have been sufficiently high enough to secure his current tier placement with some smashers claiming that he and Bowser should rise up the tier list even more as ZeRo has the characters among the top 15 characters in the game also claiming that "they have top-tier potential" while other smashers like Dabuz believe that they cannot be ranked any higher due to their many disadvantageous matchups and poor time landing. This king of the jungle really, really loves bananas. His adventures usually start with people stealing his hoard of them. In Smash Bros., he's known for his incredible strength and long reach. Despite his size, he's still pretty quick. He can even jump carrying heavy items! Use this knowledge well. With help from Diddy Kong and his Animal Friends, this banana-loving king of the jungle will take on anyone causing trouble on his turf. The best things about him in this game are his colossal strength, his speed, his long reach and the fact that he can jump while holding heavy items. Make sure you use all that to your advantage! Donkey Kong pulls no punches when it comes to fighting. Or headbutts, as it turns out. His Headbutt special move will bury anyone on the ground who gets hit, leaving them open to some serious damage. If Donkey Kong strikes an airborne foe with this move, they'll go crashing downward. Donkey Kong's always been one to use his head. Anyone who's been on the receiving end of his Headbutt special will tell you that. If they're on the ground when it hits them, they'll get buried, leaving them open to a serious walloping. If they're in the air, though, they might find themselves being knocked down. Either way, it’s going to hurt. All-Star Battle: Regulars: Donkey Kong is one of the opponents fought in this event. All of the opponents are the eight starter characters of the "perfect-attendance crew" from Super Smash Bros. Guardian of the Jungle: Donkey Kong, aided by two Diddy Kongs, must defeat three Duck Hunts. The Jungle in Chaos: As Diddy Kong, the player must defeat twenty Donkey Kongs wearing Bunny Hoods. The Original Heavyweights: As Mario, the player must defeat Donkey Kong and Bowser. 1988: Donkey Kong and Diddy Kong must defeat three Marios, each one larger than the last. Flat Fracas: Wario and Mr. Game & Watch must defeat a giant shadow Donkey Kong and a shadow Mario. Donkey Kong in the Nintendo Direct from April 8th, 2014. Donkey Kong's appearance during E3 2013. Donkey Kong's appearance in Super Smash Bros. for Nintendo 3DS. Using Spinning Kong on Mario and Samus in Super Smash Bros. for Wii U. Using Hand Slap on Kirby and Link in Super Smash Bros. for Nintendo 3DS. Being hit by Toon Link's Home-Run Bat. Taunting alongside King Dedede, Mario, and Bowser. Pikachu footstool jumping on Donkey Kong. Wii Fit Trainer using her up throw on Donkey Kong. Using Spinning Kong alongside Pikachu. Using Spinning Kong on enemies in Smash Run. Using Storm Punch, one of his custom moves. Donkey Kong's crowd chant references the DK Rap from Donkey Kong 64. Donkey Kong's default moveset has four meteor smashes, the most out of the entire cast. In Super Smash Bros. for Nintendo 3DS, Donkey Kong's mouth has a tendency to become oddly contorted if he is pummeled. However, this is merely a graphical issue. Donkey Kong's alt. trophy in Super Smash Bros. for Wii U resembles his Adventure Mode trophy in Melee. This page was last edited on March 16, 2019, at 18:38.